Some claim it is a magical health elixir and some say it is not but people who tasted this keto coffee says it is delicious! We are talking about bulletproof coffee here which has gained popularity just like turmeric latte. Why people are going gaga over bulletproof coffee? Those who wants to lose weight by following keto or ketogenic diet, are drinking bulletproof coffee in the morning hours. Its nutritional value is different than normal, traditional coffee. Most of us who love to drink coffee either will go for black coffee or with little milk, little sugar. Some prefer bit more flavor and add cinnamon into it. Keto’s bulletproof coffee recipe is designed to give more energy and fullness for most of the day! People who invented say recipe of bulletproof coffee is designed to burn fat, to give energy and preparation is fun as it ends up looking like latte. Reasons people drink bulletproof coffee: To curb hunger and keep full for many hours, to increase energy and metabolism, balance hormones, get mental clarity and helps to focus, helps in weight loss. 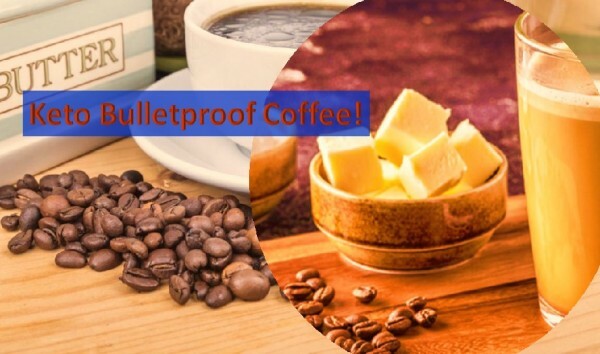 The term “bulletproof” originated from the brand Bulletproof which sells coffee beans under its brand name, MCT oil also known as Brain Octane Oil and butter! It was coined by David Asprey, CEO of The Bulletproof company. How the ingredients are effective in your diet? MCT oil is a saturated fat that has medium chain triglycerides. Unlike long chain triglycerides that must go through series of chemical reaction to release energy in our body, MCT with shorter chains is easy for body to use up fast and almost readily available to use. Apart from this, it is known to support healthy gut, curb food cravings, decrease fat storage, gives clarity and energy, good for heart health, sharpens mental clarity and boosts metabolism by inducing calorie burn. It is digested faster than other fats. Butter or ghee: Butter makes bulletproof coffee cream. Preferably adding grass fed butter because it blends well with coffee. In addition, grass fed butter has healthy fats and fat-soluble vitamins that nourishes body. It is rich in conjugated linoleic acid (CLA), a chemical known for its anti-inflammatory properties. If a person cannot consume butter for diet and health reasons, they can opt for ghee. Only different using butter Vs. ghee is, ghee is oily and does not give a latte appearance for coffee. Coconut oil has several health benefits from reducing body inflammation to skin health. If not MCT oil adding coconut oil as an alternative as it is a true keto coffee ingredient. Coffee: Coffee as we know contains caffeine that keeps us going through the day. It keeps brain alert and active. Adding butter or ghee or MCT oil in the coffee won’t it add calories? As per keto diet -eating more fat is a good way to combat food cravings and to lose weight. Eating fat makes us fill fuller long time. Bulletproof coffee said to have same effect – it slows down absorption of carbohydrates, keeps us full for longtime, helps to balance hormones and good quality fat absorbs vitamins, including vitamins A, D, E and K. If someone wants to follow keto diet, bulletproof coffee is the start as it truly contains keto ingredients. Like other products that claim, “good for health,” bulletproof coffee also surrounded by criticism about its claim. Some question about adding MCT oil and its use and feel that it is one of the extreme diets. It was tested mostly on animals and tested less on humans in small numbers. To lose weight we might follow diet and may be successful in losing some pounds. Challenge is to continue the diet by following it strictly. Bulletproof coffee is part of keto diet, but if you need other nutrients then you must also think about other foods- not just relying on one drink in the morning. There is no harm in trying this coffee but also find a right diet for you that gives all nutrients you need!